Craig: I like how Leon came out in these pages. I don’t think I draw him as well in many of the future pages. J.D. : The lighting really helps. It brings out his most dynamic features. 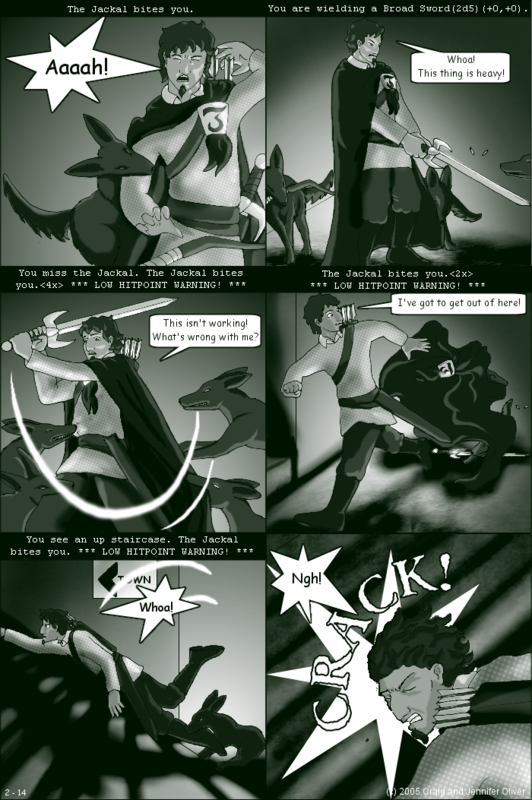 Craig: In panel 2, the jackal runs off with Leon’s bow. J.D. : Well, in panel 1, he dropped it when the jackal bit him in the arm. Craig: Although jackals don’t technically pick up items in Angband, I’ve had enough dogs to know that anything that isn’t bolted down is fair game for the canine randomizer. J.D. : And even some things that are, given enough time to chew through the bolts. Craig: Leon’s fumbling with the broadsword is based on my first experience with a metal weapon. I was playing in a college performance of Macbeth and I had to train to use weapons for several swordfight scenes in the play. Although they were blunt, the swords we used were made of real steel and were *heavy*. It took some serious arm strength to wield one well enough to look convincing. J.D. : I was jealous that I didn’t get to practice with the swords, but the servants didn’t need to be trained to fight. Craig: That would have been awesome! The maids jump out of the wings and blitz Macduff’s soldiers! I totally would have paid to see that. J.D. : I did get to be a soldier in a production of The King and I’s Uncle Tom’s Cabin scene, because they liked the way I jumped out on stage from the wings. Craig: To script this scene, I ran a bunch of low-level Dunadan rangers through Angband to see how long they would last against a bunch of jackals. Leon did fairly well to survive seven hits without dying. J.D. : It was so much fun shading the jackals. I keep saying it, but I love the lighting in the dungeon scenes. Craig: I’m glad, because as we get further along in the comic there’s a lot more dungeon action. Sooner or later Leon’s going to have to actually head down and, you know, play the game. This entry was posted on Tuesday, June 5th, 2007 at 12:00 am	and is filed under Penance. You can follow any responses to this entry through the RSS 2.0 feed. You can leave a response, or trackback from your own site. Cheers, I can’t wait. This strip looks fabu. Craig: The sword must’ve been stainless. Carbon or spring-steel (the metals that ‘real’ swords are made of) aren’t that heavy. That thing about too heavy swords made me wonder how long it takes Leon to heal his wounds. ^^ Are they healed after 100 turns or does it take a week? For Leon… i hope 100 turns. I can’t wait to see how Leon is going to survive deeper in the dungeon. One thing we can guess with reasonable certainty: Leon is probably going to have to do some working out before he can survive any lower. He might also want to learn to read and speak elvish (or whatever language(s) in which the scrolls and magic books are written) so he can recall and make use of his magical abilities as a ranger. Hahaha. He’s definitely going to have to rely on other players and not be a backstabber. Seamus: Thinking about it in light of your comment, I guess the blades were probably made of iron, not steel. They had the tendency to pick up a little oxidation, and they could wobble if you held them wrong. Holding them wrong was easy to do, because they weren’t weighted as weapons — all the weight was in the blade.